This Pumpkin Cheesecake has three layers. It starts with a ginger flavored Graham Cracker Crust. Next, the cream cheese filling combines a New York style cheesecake with the earthy flavor of pumpkin puree and its complementary spices. The cake is finished with a smooth layer of vanilla flavored sour cream. This dessert is excellent any time of the year, but it's particularly nice in the Fall. So let's start with the crust. It is a basically a Graham Cracker Crust, only some of the graham cracker crumbs are replaced with crushed ginger cookies (homemade or store bought). 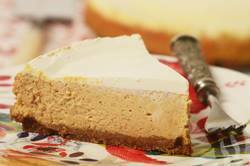 This adds a wonderful spicy flavor which goes so well with the pumpkin flavored cheesecake filling. If you prefer a plain graham cracker crust, replace the crushed ginger cookies with 1/2 cup (50 grams) of graham cracker crumbs (or crushed Digestive Biscuits). When making cheesecakes make sure all your ingredients are at room temperature so they blend together to create a smooth texture. In order to prevent the cheesecake from cracking beat the ingredients at low speed as, unlike a butter cake, you do not want to incorporate a lot of air into the batter. You only want to beat the ingredients until they are nice and smooth. And use full fat cream cheese and have it at room temperature as cold cream cheese is harder to beat and you can end up with graininess. You can use canned pure pumpkin in this recipe or make your own pumpkin puree. Fortunately there are excellent brands of canned pumpkin on the market which match the quality of homemade. Just use the pure pumpkin puree that does not have any spices added to it. Now, if you want to make your own puree, use the smaller pumpkin varieties like Sugar Pie, Baby Bear or Cheese Pumpkin (approximately 5-7 lbs., 2 1/2 - 3 1/2 kg.). To make the puree, cut the pumpkin in half lengthwise, remove seeds and stringy fibers, and place cut-side down on a greased baking sheet. Bake at 350 degrees F (180 degrees C) for approximately 45 minutes to 1 1/4 hours (depending on size) or until easily pierced with a knife. Scoop out the pulp and puree in a food processor until smooth. Strain through cheesecloth to extract all the liquid. Cool before using. Judging when a cheesecake is fully baked always presents a challenge, as they do need to be removed from the oven when the center is still a little wet and wobbly. Cracking can also be a problem. As a cheesecake bakes its moisture evaporates. If too much moisture is lost (when overcooked), or if it evaporates too quickly (oven temperature too hot) cracking will occur. So be sure to follow your recipe's instructions. Also, to prevent cracking, shortly after you remove the cheesecake from the oven, run a sharp knife around the inside edge of the cheesecake. Once the cheesecake has completely cooled, cover with plastic wrap and refrigerate until firm, preferably overnight. This allows the cake to set, flavors to meld, and produces a creamier texture. Pumpkin Cheesecake: Preheat your oven to 350 degrees F (180 degrees C) and place the oven rack in the center of the oven. Butter, or spray with a non stick spray, an 8 inch (20 cm) spring form pan. Crust: In a medium sized bowl, combine the graham cracker crumbs, crushed ginger cookies, sugar, and melted butter. (This can be done in your food processor.) Evenly press the mixture onto the bottom of the prepared pan. Bake about 8 minutes or until set. Let cool while you make the cheesecake filling. Pumpkin Cheesecake: In a separate bowl, combine the sugar with the ground cinnamon, ginger, cloves, nutmeg, and salt. In the bowl of your electric stand mixer, fitted with the paddle attachment (or with a hand mixer), beat the cream cheese, on low speed, until smooth. Add the sugar mixture and beat until combined and creamy smooth. Add the eggs, one at a time, beating until incorporated. Scrape down the sides and bottom of the bowl as needed. Beat in the vanilla extract and pumpkin puree. Pour the filling over the crust and place the spring form pan onto a larger baking sheet to catch any drips. Before baking the cheesecake, place a pan, filled halfway with hot water, on the bottom shelf of your oven. This will keep the air moist. Bake the cheesecake for 30 minutes at 350 degrees C (180 degrees C) and then reduce the oven temperature to 325 degrees C (165 degrees C) and continue to bake the cheesecake for another 10 - 20 minutes, or until the edges of the cheesecake are puffed but the center still looks a little wet and jiggles when you gently shake the pan. Topping: Meanwhile, whisk together the sour cream with the vanilla extract and sugar. Immediately spread the topping over the cheesecake and return to the oven and bake about 8 to 10 minutes to set the topping. Remove from oven and place on a wire rack to cool. Loosen the cheesecake from the pan by running a flat spatula or sharp knife around the inside edge (this will help prevent the cake from cracking). Then place a piece of foil over the top of the pan so the cheesecake will cool slowly. When completely cooled, cover and refrigerate at least eight hours, preferably overnight, before serving. This cheesecake can be stored in the refrigerator for about five days, or it can be frozen.